Here's a card going in the mail soon to a special little guy in our lives. The paper is part of My Mind's Eye Lil' Robots collection. I wanted the stripe because I thought it would be great colors and decided to get the little gears too just for the fun designs. As soon as it came - like the same day! 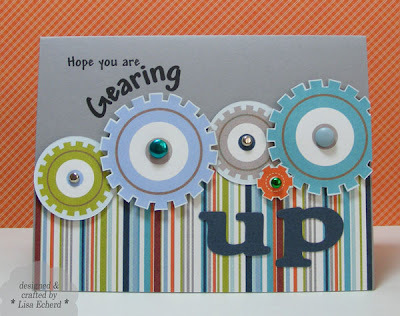 - I was cutting out these little gears and putting together this card. The Cricut did "up" for me and I printed the greeting from Microsoft Word. On the inside it says "for a BIG birthday." There is no stamping at all - just great DSP! This paper goes great with many Stampin' Up! colors, too. Cardstock: Going Gray from SU!